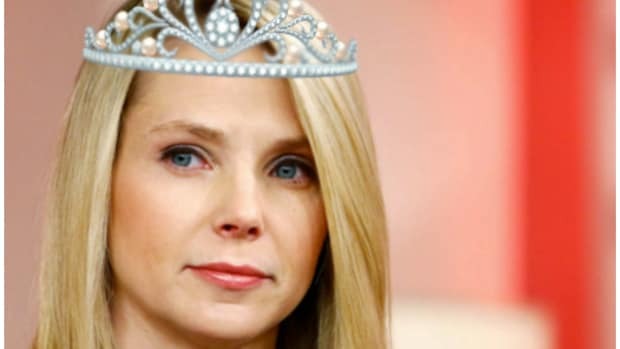 Marissa Mayer v Yahoo investors; Fed's Fischer supports higher rates; Women gaining in billionaires club; "This Guy Gets His Back Hair Shaved Into Works Of Art"; and more. Shareholders are pressuring management to sell the core Internet business instead of attempting to spin it off into a separately traded company — a process that could take as long as a year. “The better alternative from both a value and timing standpoint is for Yahoo to just sell the core business right now,” one shareholder told The Post. This person believes a sale of the struggling business, including display advertising and search, will lead to a higher valuation as opposed to waiting for the market to value the new publicly traded entity and risk further decline. A number of tech and Internet companies failed to reach their private valuations in their 2015 IPOs, while others later fell below their high-water marks in open trading, sending a chill through the growing crowd of private startups valued at $1 billion. Big investors, concerned about the ability of IPOs to continue to generate hefty returns, in recent months have pulled out of funding rounds and marked down the value of their stakes in private startups. “If asset prices across the economy -- that is, taking all financial markets into account -- are thought to be excessively high, raising the interest rate may be the appropriate step,” Fischer said in a speech at the annual American Economic Association meeting in San Francisco on Sunday. Heroz is hoping that the lessons it has learned about how to recreate human judgment to help its computers win at shogi can be applied to the crunching of data for banks when they decide whether customers are credit-worthy, according to Heroz’s Chief Financial Officer Daisuke Asahara. “There are times that computers can see as correct what humans perceive to be wrong,” said Asahara, a former investment banker with Goldman Sachs Group Inc., in an interview last month. Mike Wolfe tells KTVB-TV that after years of feeling ashamed of his body hair, he asked a friend in 2008 to trim an American flag on his back rather than undergoing hair removal processes like shaving or waxing. Since then, the two meet up several times throughout the year to design a new creation onto Wolfe&apos;s back...Tyler Harding, a former graphic artist who has been friends with Wolfe for more than a decade, says it takes about an hour to complete the artistic trim. And the creations can now be seen on a calendar -- called a Calend-hair -- available for $20. Some proceeds will benefit a charity at Wolfe&apos;s church. Designs are uniquely named, such as Grim Reap-hair for October and M-hair-achi Band for May. Tech leaders such as Elon Musk of Tesla Motors and venture capitalist Peter Thiel have warned that rogue AI, or artificial intelligence, could one day threaten the human race. But Mark Zuckerberg has set himself the challenge this year of building his own personal AI assistant, rejecting fears of a super-intelligence running amok as “far-fetched”. In a post on his company’s website late on Sunday, the Facebook founder said he had decided to build a smart machine to control functions in his house and help him work, akin to a disembodied butler. He compared it with Jarvis, an intelligent computer in the movie Iron Man. According to the new Wealth-X study from UBS Group and PwC (and representing 75 percent of global billionaire wealth, or 1,347 of the richest of the rich), the female billionaire population expanded faster than the male billionaire set over the past two decades. As turmoil grips the energy business, companies are under increased pressure to find capital, which usually means turning to Wall Street for answers. Mr. Santangelo’s team at Credit Suisse worked on deals accounting for more than one-third of that $19 billion sum, according to a Wall Street Journal analysis of Dealogic and bank data. Dealogic estimates Credit Suisse earned about $116 million from such offerings, more than any other bank. Townsville police said officers from the Forensic Unit were investigating a suspected crime scene in the Alice River suburb Wednesday when an officer recognized a banana sculpture made from Lego bricks. The officer recognized the item as a sculpture by artist Ryan "The Brickman" McNaught, who suffered the thefts of several Lego sculptures from the Strand Ephemera sculpture festival in August. "The forensic officer was over the moon to discover the artwork and if it was not for his passion for Lego and keen detective work, the art piece would have gone undetected," police said in a news release. Marissa Mayer will not be going hungry; Bernanke thinks we're all crazy; of course Elon's new celeb relationship is bullish for Tesla; and more. Warren Buffett trashes Valeant, hedge fund fees; Marissa Mayer gets $55 million if ousted; Now You Can Get Pizza In A Pizza Box Made Out Of Pizza; and more. JPMorgan Loss Claims Official Who Oversaw Trading Unit (NYTimes) The $2 billion trading loss at JPMorgan Chase will claim its first casualty among top officials at the bank as early as Monday, with chief executive Jamie Dimon set to accept the resignation of the executive who oversaw the trade, Ina R. Drew. Ms. Drew, a 55-year-old banker who has worked at the company for three decades and serves as chief investment officer, had repeatedly offered to resign since the scale of the loss became apparent in late April, but Mr. Dimon had held off until now on accepting it, several JPMorgan Chase executives said. Two traders who worked for Ms. Drew also planned to resign, JPMorgan Chase officials said. Her exit would mark a stunning fall from grace for one of the most powerful women on Wall Street, as well as a trusted lieutenant of Mr. Dimon...Former senior-level executives at JPMorgan said it was a shame that Ms. Drew has ended up suffering much of the fallout from the soured trade. They said that Thursday’s announcement of the $2 billion loss was the first real misstep that Ms. Drew has had and said that the position was not meant to drum up bigger profits for the bank, but rather to ensure that JPMorgan could continue to hold lending positions in Europe. “This is killing her,” a former JP Morgan executive said, adding “in banking there are very large knives.” Jamie Dimon: Trading Losses Are Not Life-Threatening (CNBC) “This is a stupid thing that we should never have done but we’re still going to earn a lot of money this quarter so it isn’t like the company is jeopardized,” he said in an interview with NBC’s “Meet with Press.” “We hurt ourselves and our credibility, yes — and that you’ve got to fully expect and pay the price for that.” Yahoo’s Thompson Out Amid Inquiry; Levinsohn Is Interim CEO (Bloomberg, earlier) Thompson, 54, was brought on to orchestrate a turnaround after Google Inc. and Facebook Inc. lured users and advertising dollars. Thompson’s undoing stems from erroneous biographical references to him as holding a bachelor’s degree in computer science from Stonehill College. A former EBay Inc. (EBAY) executive, he earned a degree in accounting from the Easton, Massachusetts- based school, and the information is correctly listed in EBay regulatory filings and some Yahoo press releases. The incorrect degree showed up in Yahoo’s April 27 10-K filing, as well as on the company’s website. As part of the board changes, Daniel Loeb, chief executive officer of Third Point, joins as a director along with Harry Wilson and Michael Wolf. A fourth nominee, Jeffrey Zucker, said in today’s statement that he withdrew his nomination to allow a quick transition. Euro Officials Begin to Weigh Greek Exit (Bloomberg) Greek withdrawal “is not necessarily fatal, but it is not attractive,” European Central Bank Governing Council member Patrick Honohan said in Tallinn on May 12. An exit was “technically” possible yet would damage the euro, he said. German Finance Minister Wolfgang Schaeuble reiterated in an interview in Sueddeutsche Zeitung that member states seeking to hold the line on austerity for Greece could not force the country to stay. LightSquared Moves Toward Bankruptcy Filing (WSJ) Hedge-fund manager Philip Falcone's LightSquared Inc. venture was preparing Sunday to file for bankruptcy protection after negotiations with lenders to avoid a potential debt default faltered, said people familiar with the matter. LightSquared and its lenders still have until 5 p.m. Monday to reach a deal that would keep the wireless-networking company out of bankruptcy court, and there were some indications over the weekend that a final decision hadn't yet been reached on its fate. Still, the two sides remained far apart, and people involved in the negotiations expected LightSquared to begin making bankruptcy preparations in earnest. Facebook cofounder living large in Singapore as he stiffs US for a possible $600M in taxes (NYP) Saverin is renouncing his US citizenship in favor of Singapore, the Southeast Asian city-state that has no capital-gains tax, where he has lived like royalty since 2009. The move already has saved him about $288 million in taxes, and will save him much more if he chooses to sell his $4 billion personal stake in Facebook, which goes public next week. “This pisses me off,” fellow tech-industry billionaire Mark Cuban spat on Twitter Friday upon hearing news of Saverin’s decision. Saverin’s spokesman has defended the move, claiming he has investments in the Far East, and Europe and the permanent move makes perfect sense. “Eduardo recently found it more practical to become a resident of Singapore since he plans to live there for an indefinite period of time,” Saverin’s spokesman told Bloomberg. JPMorgan Unit's London Staff May Go as Loss Prompts Exits (Bloomberg) The entire London staff of JPMorgan Chase’s chief investment office is at risk of dismissal as a $2 billion trading loss prompts the first executive departures as soon as this week, a person familiar with the situation said. The firm is examining whether anyone in the unit, which employs a few dozen people in London, sought to hide risks, said the person, who requested anonymity because the deliberations are private. In Wake Of JPMorgan Loss, Rivals Fret About New Rules, Downgrades (WSJ) Over the weekend, rival banks scurried to explain why they believe a similar trading loss couldn't happen at their firm. Some companies pointed to moves already taken to reduce risk and sell off volatile and opaque assets such as derivatives on credit indexes. In a statement, Citigroup "has a small amount of straight-forward economic hedges managed at the corporate center to mitigate our credit exposure, principally relating to consumer loans." About half of that total is in cash, with most of the rest in U.S. Treasury bonds and other conservative investments. At Morgan Stanley, the portfolio most similar to J.P. Morgan's investment office is a $32 billion "available for sale" portfolio. The portfolio primarily consists of easily traded U.S. Treasury and government agency securities. It doesn't hold any derivatives instruments, a person familiar with Morgan Stanley's operations said. Goldman Sachs has no similar unit to the one at J.P. Morgan that suffered the loss. Apple Founder Wozniak to Buy Facebook Regardless of Price (Bloomberg) “I would invest in Facebook,” he said in an interview yesterday on Bloomberg Television. “I don’t care what the opening price is.” Missing: Stats on Crisis Convictions (WSJ) It is a question that has been asked time and again since the financial crisis: How many executives have been convicted of criminal wrongdoing related to the tumultuous events of 2008-2009? The Justice Department doesn't know the answer. That is because the department doesn't keep count of the numbers of board-level prosecutions. In a response earlier this month to a March request from Sen. Charles Grassley (R.,Iowa), the Justice Department said it doesn't hold information on defendants' business titles. "Consequently, we are unable to generate the [requested] comprehensive list" of Wall Street convictions stemming from the 2008 meltdown, the letter from the Department of Justice to Mr. Grassley said. Man Charged in Death Offers Victim's Foot for Deal (AP) A homeless man charged with killing and dismembering his friend says he can't remember much about the crime. But in a jailhouse interview, Leslie Sandoval told the Anderson Independent-Mail he remembers where he put the victim's missing left foot and is willing to tell a prosecutor if she will make him a deal. Sandoval says he went on a January drinking binge with Seth Foster. Foster's torso was found under an Anderson home, and his head, hands and right foot were found different places. Sandoval says he is confused about exactly what happened. But he disagrees with a coroner's finding he beat Foster and denies a claim from investigators that he confessed and gave them the knife used to dismember Foster. Morgan Stanley Posts Loss (WSJ) "The rebound in fixed income and commodities sales and trading indicates that clients have re-engaged after the uncertainty of the rating review in the previous quarter," Chief Executive James Gorman said, referring to Moody's Investors Service's move over the summer to downgrade the credit rating on more than a dozen banks. "We are beginning to unlock the full potential of the Global Wealth Management franchise, having increased our ownership of, and agreed on a purchase price for the rest of, Morgan Stanley Wealth Management." For the quarter, Morgan Stanley reported a loss of $1.02 billion, compared with a year-earlier profit of $2.2 billion. The per-share loss, which reflects the payment of preferred dividends, was 55 cents compared with a profit of $1.15 a year earlier. Stripping out the impact of debt-valuation changes, the per-share profit was 28 cents versus two cents a share a year ago. Revenue fell 46% to $5.29 billion, including a negative impact of $2.3 billion from the tightening of credit spreads related to debt. Stripping out debt-valuation changes revenue was up 18% to $7.55 billion. Analysts polled by Thomson Reuters expected earnings of 24 cents, excluding gains related to debt, on revenue of $6.36 billion. Morgan Stanley Reduces Investment-Bank Pay to $5.2 Billion (Bloomberg) The ratio of compensation to revenue in the unit fell to 44.9 percent, compared with 48.4 percent in the same period a year earlier, when excluding accounting gains and losses related to the firm’s credit spreads. That’s still higher than Goldman Sachs and JPMorgan’s investment bank. Compensation and benefits for all of Morgan Stanley totaled $12 billion in the first nine months, down 4 percent. Goldman Ex-Employee Says Firm Pushed Europe Bank Options (Bloomberg) Goldman Sachs sought to profit last year by persuading clients to buy and sell stock options on European banks such as BNP Paribas SA and UniCredit SpA, according to former employee Greg Smith’s new book. “We must have changed our view on each of these institutions from positive to negative back to positive ten times,” Smith writes in “Why I Left Goldman Sachs: A Wall Street Story,” scheduled for release on Oct. 22. “I remember thinking, ‘How can we be doing this with a straight face? No thinking client could believe that conditions on the ground could change that frequently.”’ [...] Smith also describes being disappointed with his $500,000 bonus at the end of 2006. “By any measure, I should have felt exceptionally lucky and grateful,” he writes. “But by the warped logic of Goldman Sachs and Wall Street, I was being screwed.” U.S. to Get Downgraded Amid Fiscal ‘Theater,’ Pimco Says (Bloomberg) “The U.S. will get downgraded, it’s a question of when,” Scott Mather, Pimco’s head of global portfolio management, said today in Wellington. “It depends on what the end of the year looks like, but it could be fairly soon after that.” Asian Scion's Trades Draw Scrutiny (WSJ) A federal probe into an alleged multimillion-dollar insider trading scheme is focusing on the son of a deposed Central Asian autocrat once courted by the U.S. as a key ally in the war on terror, according to people involved in the investigation. The globe-spanning criminal case marks a turnabout by the U.S. against a ruling family it once relied on to keep open military supply lines to Afghanistan. For years, the U.S. maintained good relations with then-Kyrgyzstan President Kurmanbek Bakiyev. Now, the U.S. has prepared charges against the former strongman's son, Maksim Bakiyev, who officials say spent some of his exile in London profiting from illegal tips on stocks trading on the New York Stock Exchange and Nasdaq. On Friday, the younger Mr. Bakiyev, 35, was arrested in England on an extradition request from the U.S. Mr. Bakiyev's U.K. attorney, Michael O'Kane, declined to comment. Computer programmer 'quadruples productivity' after hiring a woman to slap him in the face every time she catches him looking at Facebook (DM) Maneesh Sethi placed an advert on Craigslist to recruit someone willing to monitor what he was looking at on his laptop. The computer expert and writer, from San Francisco, now pays a female employee £5 ($8) an hour to strike him in the face if she spots him wasting time on social media. Mr Seethi claims the unusual motivational system has helped him boost his productivity from just 35 percent to around 98 percent during the working day...Mr Seethi published details on his blog of his Craigslist advert, which was entitled '(Domestic gigs) Slap me if I get off task'. In it he wrote: 'I'm looking for someone who can work next to me at a defined location (my house or a cafe) and will make sure to watch what is happening on my screen. 'When I am wasting time, you'll have to yell at me or if need be, slap me. 'You can do your own work at the same time. Looking for help asap. Mr Seethi said he was inundated with offers from potential slappers and quickly hired a volunteer he names only as Kara. He wrote: 'Within minutes, my inbox began blowing up. Up to 50% of Greek Workforce Strikes; Tipping Point Nears (CNBC) As European Union leaders prepare to meet in Brussels on Thursday, Greece’s workers aim to make their voices heard by holding a 24-hour strike bringing the country to a halt. With the economy in the fifth year of a recession, the lost production could prove counterproductive and cost the economy 100 million euros ($131 million), according to one expert. Most business and public sector activity is expected to grind to a halt during the strike called by the ADEDY and GSEE unions that represent around 2 million people — half of Greece’s workforce. A protracted news blackout is also expected as television and radio broadcasters and newspapers shut for the day, according to Reuters. Spain Banks Face More Pain as Worst-Case Scenario Turns Real (Bloomberg) Spain’s request for 100 billion euros of European Union financial aid to shore up its banks is increasing concern about the nation’s growing liabilities. Standard & Poor’s downgraded the country’s debt rating by two levels to BBB-, one step above junk, from BBB+ on Oct. 10, saying it wasn’t clear who will bear the cost of recapitalizing banks. It cut the ratings of 11 lenders including Banco Santander SA and Banco Bilbao Vizcaya Argentaria SA, Spain’s largest, two days ago, citing the sovereign downgrade. Brothels Rescue Cash-Strapped Greek Soccer Team (AP) Players on a cash-strapped Greek soccer team now wear pink practice jerseys with the logos "Villa Erotica" and "Soula's House of History," two bordellos it recruited as sponsors after drastic government spending cuts left the country's sports clubs facing ruin. Other teams have also turned to unconventional financing. One has a deal with a local funeral home and others have wooed kebab shops, a jam factory and producers of Greece's trademark feta cheese. But the amateur Voukefalas club — whose players include pizza delivery guys, students, waiters and a bartender — has raised eyebrows with its flamboyant sponsorship choice. Prostitution is legal in Greece, where brothels operate under strict guidelines. Though garish neon signs advertising their services are tolerated, the soccer sponsorship has ruffled some feathers in the sports-mad city of Larissa. League organizers have banned the pink jerseys during games, saying the deal violates "the sporting ideal" and is inappropriate for underage fans...Brothel owner Soula Alevridou, the team's new benefactor, has already paid more than 1,000 euros ($1,312) for players to wear her jerseys. The team is appealing the game ban, but that doesn't worry the 67-year-old Alevridou, who says she's only in it because she loves soccer. "It's not the kind of business that needs promotion," she said, dressed all in white and flanked by two young women in dark leggings at a recent game. "It's a word-of-mouth kind of thing." 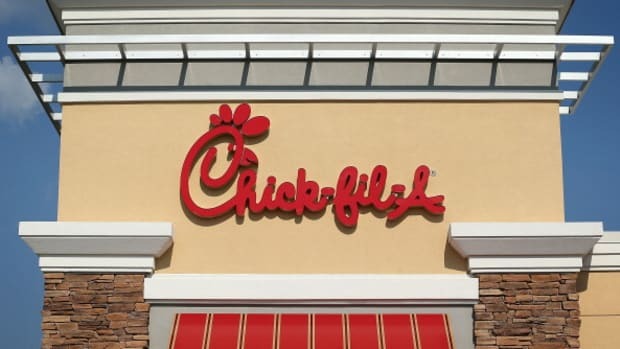 AB InBev ups SABMiller offer; Deutsche Bank must face subprime suit; Marissa Mayer probably won't get another CEO job right away; Man head-butted mother in face because she brought home Chick-fil-A for dinner; and more. 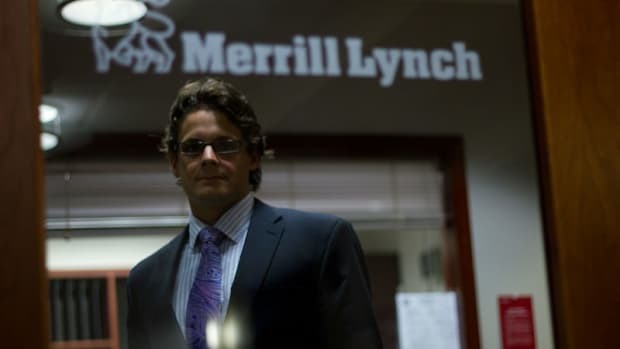 Merrill Lynch rejiggers itself; Larry Fink is now a modern art masterpiece; Cristiano Ronaldo is too, arguably; and more.